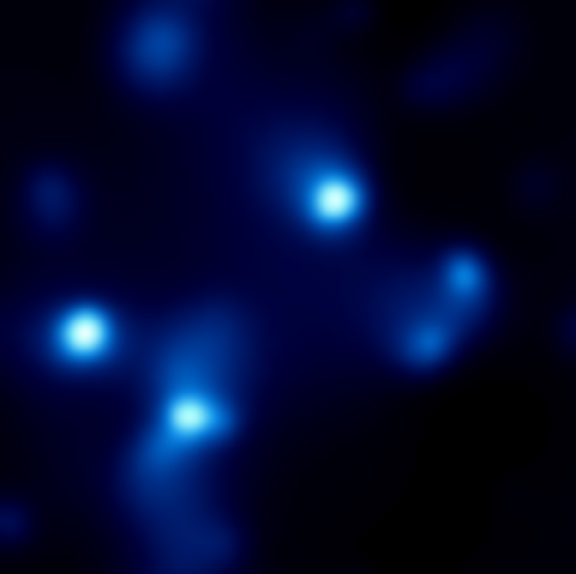 This Chandra image presents the first detection of X-rays from stars in the Quintuplet Cluster, an extremely dense young star cluster near the Galactic Center.Because dust blocks visible light from the Galactic Center, the cluster was not discovered until 1990 when it was detected with an infrared telescope. Named for its five brightest stars at infrared wavelengths, the Quintuplet is known to be home to hundreds of stars. 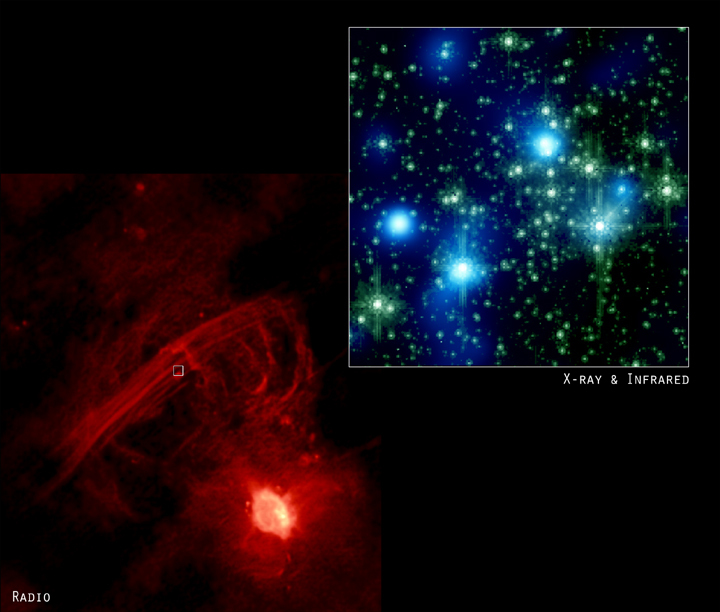 Several of these are very massive stars that are rapidly losing gas from their surfaces in high-speed stellar winds. The bright point-like concentrations of 50 million degree Celsius gas in Chandra's image are thought to be caused by collisions between the high-speed winds in massive stars that have closely orbiting partners. Colliding stellar winds could also explain the diffuse X-radiation seen between the stars in the Quintuplet. The detection of radio waves from hot gas in this region provides further evidence for vigorous heating of gas by winds from massive stars. Scale Image is 0.6 arcmin across. Coordinates (J2000) RA 17h 46m 14.80s | Dec -28° 49' 49.35"
References C. Law & F. Yusef-Zadeh, 2004, astro-ph/0404544 (to appear in Astrophys. J. ).